Buy through MusicWeb for £6.25 postage paid World-wide. rec. St Dunstan’s Church, Mayfield, 25-28 April 2001. DDD. That Luiza Borac has established a reputation as one of the finest interpreters of Enescu’s piano music today is beyond doubt. Two impressive releases attest to that; but it would be a mistake to categorise her as ‘just’ an Enescu player. This disc shows why. Kinderszenen opens with a delicately nuanced account of "About foreign lands and peoples", which does not overstretch the slight moments of hesitancy within the writing, as some pianists are tempted to do. The second scene’s "curious story" is perhaps told in a little strait-laced a manner, as if to signify that actually the teller - Schumann, rather than Borac – finds it all a bit boring. The "catch me if you can" moment runs away with itself nicely, showing just how deftly Borac can alter the mood. The upbeat mood continues through vignettes such as "Happiness" and "Knight of the Rocking Horse". The "important event" of the sixth movement conveys much through its relative grandeur of statement, just as the following scene, "Dreaming" relies on pianistic introspection for its effectiveness. Borac does us the favour of not overplaying the music, rather she leaves it with a slight fragility. The mood of the moment dictates, almost by force, a pause before proceeding to the homely and distinctly German fireside scene. "Almost too serious" and "Frightening" initially seem cut from much the same compositional cloth, as in them both you can hear a child’s wide-eyed sense of wonder at the world around him. The child falls asleep in the penultimate scene through tiredness and "the child’s eyes cannot be closed in a nicer way", according to Clara Wieck in a letter to Schumann. She commented too on the simplicity of the set and the growth of her delight as she played them. Much of their surface simplicity is evident in Borac’s playing, as is delight in the music. A distinct strength is that she integrates the more famous scenes into the whole, rather than separating them out as focal points for attention. Above all though Borac is mindful of the underlying mood of seriousness that lurks within these short pieces. Just listen to the lofty thoughts expressed in the final scene, "The Poet Speaks". Alternative versions of Kinderszenen are legion, most inferior by a mile when placed in comparison with that recorded by Clara Haskil (Philips). Haskil’s own physical frailty seems to register all too readily through her playing, which achieves much through not distorting the work’s structure. Lang Lang, in his recent recording for DG, proves less effective in my view because he seeks to make too much out of music that should just be played, and not subjected to over-conscious interpretation. The Etudes Symphoniques comprises a set of sixteen studies and a finale, although their existence in this form took some time to transpire. Originally, twelve studies were written and published in various editions – of which the 1834 is most commonly adhered to – before Brahms and Clara Wieck released four further variations and the finale for posthumous publication. A major problem for any pianist is one of structure and overall shape of the piece in performance. However, given that even Schumann admitted much of the music was "pathos-laden" and that he tried "to break up whatever pathos there may be in them by using various colours […] a different colour each time", the performer must also consider the subtleties of a nuanced palette too. Borac, going by her recording, favours a sober balance of hues in the first half of the work, painted within a broad tempo range too. Yet the second half is more upbeat, starting with the sixth variation, which leads to a clearly articulated account of the seventh. Faster tempi continue to dominate much of the rest, even though the clarity could be helped by more distinct pedalling at times. Tonal balance is also important, and Borac’s Steinway model D grand has a soft, rich lower register which is usefully employed against the crystalline quality of the top range in appendix variation 5. Of much stronger stuff are the three remaining sections, with the finale proving notable for its grand sweep and sense of lyrical declamation. Should one be interested in comparative readings, I would suggest Ragna Schirmer’s no less insightful recording for Berlin Classics. It is recorded with a different ordering of the variations in marginally more helpful sound quality. The liner-notes on Schirmer’s set are more in depth than those for Borac, with alternative playing orders suggested should you wish to programme your CD player to explore them. Schumann’s Beethoven Etudes, WoO 31, - a work closely connected with the Symphonic Etudes - form Schirmer’s companion piece. 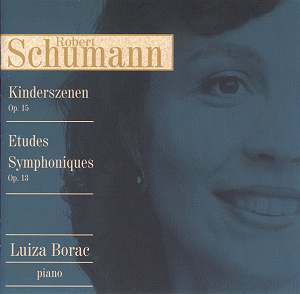 Those new to Schumann wanting Kinderszenen or those keen to discover the comparatively lesser known Etudes Symphoniques will not go far wrong with Luiza Borac as their guide. Given this disc’s special offer price as an added incentive, it is worth serious consideration, even to sit alongside other versions of choice you might own.